In a study done at Texas A&M, it was discovered that 90 percent of cats over the age of 10 had x-ray evidence of painful arthritis and their owners had no idea. Although this is disturbing, it is completely understandable as cats are well-known for hiding any signs of illness, weakness, or pain. This is instinctive because, in the wild, any sign of infirmity is an invitation to a predator. “Cats prefer their routines and stick to their habits as much as they possibly can, especially when they are in pain,” said Dr. Robin Downing, an expert on animal pain and founder of the Downing Center for Animal Pain Management in Windsor, Colorado. This makes it very difficult for cat owners to be able to observe that their feline is hurting. But, if you know what to look for, it’s much easier to see. Changes in activity level. The cat may become less active and sleep more. It may be slow or reluctant to change positions or stop jumping onto high places. On the other hand, your kitty may become more active, i.e. restless, repetitively changing positions or walking around having difficulty getting comfortable. Self-mutilation. Pain can cause repetitive licking and biting in certain areas. Although this is often associated with allergies, it can also be a result of pain. Vocalizing. Changes in the type and frequency of vocalizing can indicate the cat is in distress. Changes in eating and appetite. A cat that normally enjoys his food may become disinterested and eat much less than usual. Changes in litter box habits. A cat that has never missed the litter box may start having “accidents” outside the litter box. It could be a urinary infection or painful arthritis may make it difficult for the cat to enter the box or get into the needed position to eliminate. Posture. When cats are stiff, they change their gait and will avoid their usual leaps onto furniture. If they are experiencing internal pain such as in their stomach, they may hunch their back or become protective of a certain area of their body, hissing when being touched there. They also may start to limp. Facial expressions. Cats in pain may appear to have dilated pupils or a glazed vacant stare. They may also start to pant. Change in grooming habits. Since cats love to groom themselves, if they stop grooming and their coats start to look unkempt and dull, it is possible that arthritis or another condition makes it too painful to properly groom themselves. Other symptoms may include disinterest in people, lethargy, hiding, and aggression. If you notice any of these changes in your cat, a visit to the veterinarian is imperative. 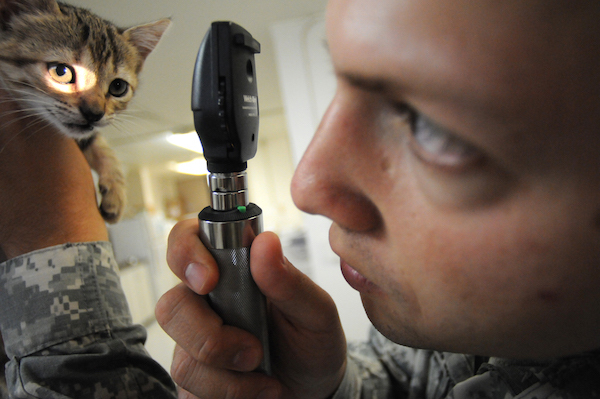 Discuss your observations with the vet. Pain management is possible and the vet can help you relieve your cat’s suffering and improve their quality of life making you both feel a lot better. —Sari Reis is a Certified Humane Education Specialist and the owner of Mission Valley Pet Sitting Services. For more information, please contact her at 760-644-0289 or visit her website at www.missionvalleypetsitting.com. I have an orange and white cat tabby cat I’ve noticed the last couple days or so she is limping and changing position a lot getting up and walking around, just not acting like herself but just, which is a lovable to my husband nit me we don’t have the money to take her and she is 15 years old um I haven’t noticed her peeing anywhere else other than the litter box I’m just wondering if there’s anything at home that I can give her pain to help her be more comfortable? If so what could I give her, how much she’s about 3lbs.I’ve also noticed her losing weight. I guess that is a good thing she was quite big.